The mysterious killer Kira has managed to take another life. Baffled by Kira’s ability to seemingly strike anyone, anywhere, Interpol have called in the legendary detective “L”. Now the cat and mouse game begins, L must feed Kira specific targets in order to deduce Kira’s location, and ultimately his identity. Meanwhile, Kira continues to enact his supernatural brand of homicidal justice, racing toward completing his list and disappearing without a trace. 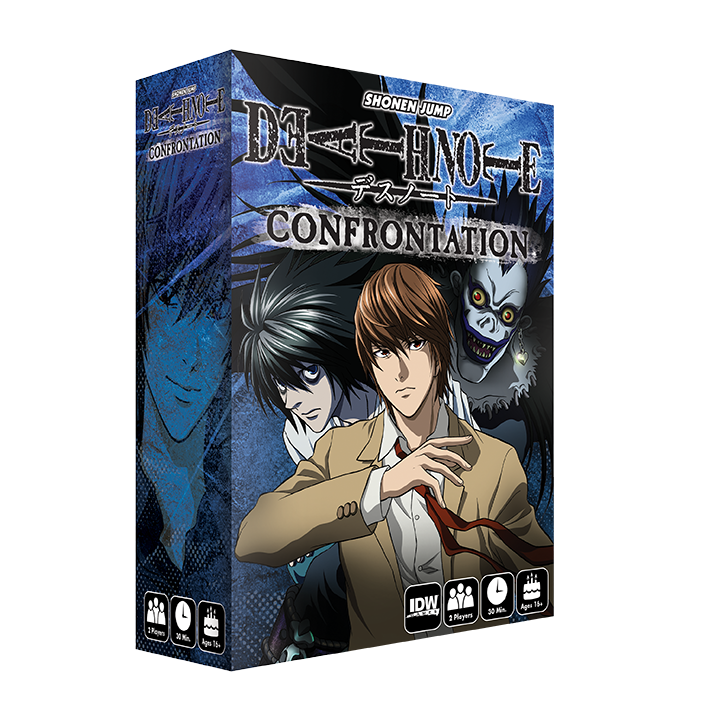 Death Note: Confrontation is a 2 player game in which one player takes on the Role of L, trying to locate and capture Kira, and the other plays as Kira, punishing those he sees deserving of the ultimate penalty. Each player uses their character’s specified notebook and either, as L, reveals criminal targets and to systematically locate Kira, or, as Kira, eliminates those targets in order to gain enough victory points.